A native of Sta. Maria, Ilocos Sur, Dar received his commendation—contained in Resolution No. 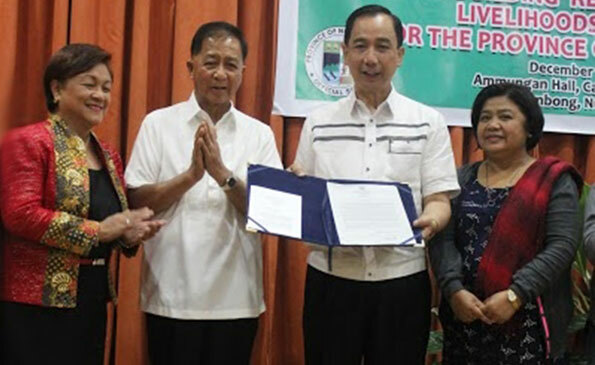 164, adopted by the House of Representatives on December 11, 2014—from Deputy Speaker Carlos M. Padilla during a launch of a farmers’ livelihood program in Nueva Vizcaya, December 22, 2014, witnessed by Nueva Vizcaya Governor Ruth Padilla and Mrs. Beatriz Dar. “On behalf of my family and ICRISAT, I humbly acknowledge the commendation of the members of the House of Representatives led by Speaker Belmonte and Deputy Speaker Padilla,” said Dr Dar, who concludes an unprecedented 15-year term on 31 December 2014, as Director General of ICRISAT. “I share this honor with millions of small Filipino farmers, whom I will serve again starting next year,” he added. To date, Dar is the only Filipino who has served as director general of a global agricultural research institute. He leaves behind a legacy benefitting millions of farmers in India, Africa, and other dryland countries in the world, including the Philippines. Through his strong leadership and governance, he has transformed ICRISAT into a leading agricultural research institute in terms of innovative research programs, impact on farmers, and financial stability, quadrupling the income and investments poured into ICRISAT since 2000, from US$21 million to US$85 million in 2014. ICRISAT has also partnered with the Philippines’ Department of Agriculture, through the Bureau of Agricultural Research (BAR), sharing modern sustainable farming technologies and cultivars of sweet sorghum, peanut, chick pea (garbanzos) and pigeon pea (kadyos) to farmers in Cagayan Valley, Ilocos, Southern Luzon, and Southern Mindanao regions. ICRISAT’s Bhoochetana or land rejuvenation approach is now adopted in three pilot regions in the Philippines, covering 30,000 hectares, to increase food production and improve the livelihood of smallholder farmers, through sustainable and integrated natural resource management. Many Filipino scientists, researchers and research managers have also visited ICRISAT, benefitting from its in-service trainings, fellowships and technical missions. “I will share my experience with Filipino farmers to transform drylands areas into productive, sustainable and climate-smart farms through Inang Lupa social movement,” said Dr Dar. “Inang Lupa aims to enhance the country’s food, nutrition and energy security, increase the productivity and incomes of small farmers through soil rejuvenation, sustainable and integrated natural resource management, use of improved cultivars and hybrids, and advocating for relevant policies and reforms in agriculture,” he said.